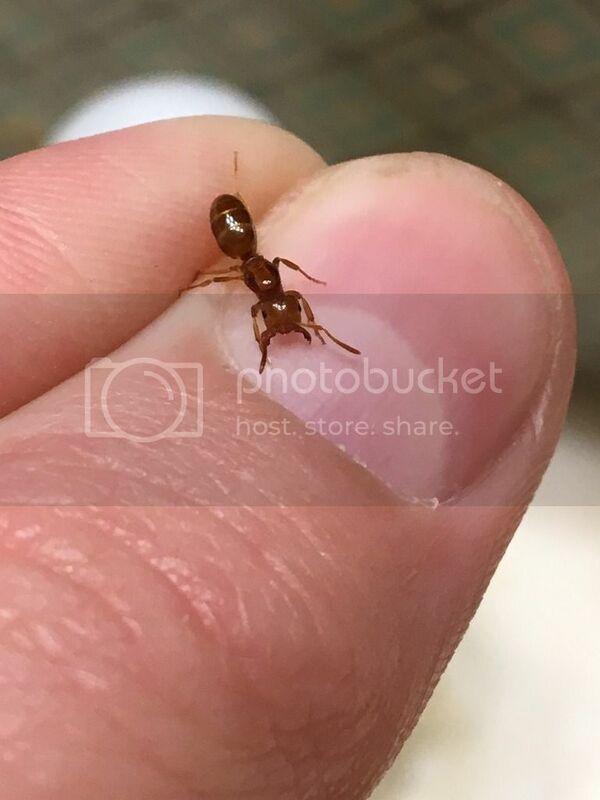 Re: HELP ID QUEEN ANT!!! AHHHHH OMG! I FOUND ANOTHER QUEEN ANT! It’s about 5 mm long and I don’t know if it’s parasitic or not? Could somebody please identify??? Thanks! Also my Camponotus subbarbatus is settling in nicely! Yep, I’m taking a fresh start! All my ants died in an accident last year in october . My first pet colony was the (somewhat easier) Lasius umbratus. As long as you can provide workers for her, give it a shot. Also, use a ruler when you are measuring the ants. Whatever that queen is, she isn't parasitic nor semi-claustral, so the normal test tube setup will be fine. Best to make your own ID threads, though. I made my own thread but nobody is anwsering... Can you help me with the species please? I don't think we can tell what your queen is, exactly, from the pictures, but you can rest assured that setting her up in a test tube is the optimal care you can give her. You would also need to provide a measurement. Can you tell me how you know she is not parasitic nor claustral? Sorry. I wasn't paying attention to details in the photo other than the ant (better to include measurements in the text). She is claustral, which means she will need no special care until her workers eclose. Semi-claustral and parasitic ants are almost always slimmer. I would recognize if she were either of those. Is it okay for me to keep my Camponotus subbarbatus near a heat source, such as a lamp? (I have her well covered so she recieves no light). What is a temperature that you think is the maximum heat that a queen ant should have so I can avoid that.